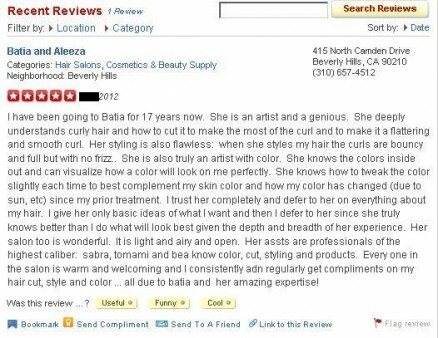 Batia, Aleeza, and staff care about your satisfaction, we love to hear what you have to say or what you think. We constantly check up on our yelp, citysearch, FaceBook comments and messages. Our goal is to improve and serve you a better hair experience but we need your help in order to do so. For the rest of July we are giving 25% off haircuts to those that give a testimony on any of our pages previously stated. Give us some pointers, what you’d like to see different at the salon, what you think we should work on, what you LOVE about us, how the products are working for you, etc.. We just want to hear your voice!